One of my many memorable experiences as a nineteen-year-old was going on weekend hikes in Guyana, handing out gospel tracts. These were succinctly printed evangelical Christian presentations of God's plan of salvation, with an appeal to recipients to "accept Jesus as personal savior". Quite often, my jaunts took me along the West Coast to Parika or south along the West Bank of the Demerara River. As a recently "born-again" Christian I was full of passion and sought every opportunity to share my new-found faith with others. That period and subsequent years will always be an important part of my life's experience. Guitar in hand and a rucksack filled with tracts on my back, I would cover many miles, sometimes a total of 20 - 25 miles on any given weekend. 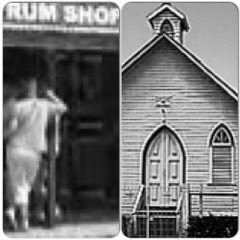 Along the way I would stop at people's houses, talk with passers-by on the public road, and play hymns on my guitar for patrons in roadside rum shops. On several occasions my friends Andre Klien, Ralph Eliot, and Rema Spencer would accompany me, but on this particular instance I was alone. Usually on those hikes there were always people who were willing to invite me into their homes for lunch or supper, so there was often no need to take food or money - not that I had either of these most of the time anyway. As for someplace to sleep, I would sleep in church buildings (which were seldom locked) along the way. On this particular occasion night caught me on a lonely stretch of country road with only a small church and no houses or other buildings in sight. There were no street lights either, just the star-filled night sky to give some luminance. I was more than a little scared, and even though I had often considered the possibility of such a scenario, I was too stubborn to back out of those hikes. To make matters worst, there was a small cemetery immediately behind the church. Growing up in a culture in which one's childhood was replete with stories of jumbies, ole-haigs, bakoos, 'white-ladies', and moon-gazers would certainly make for an active imagination that night. For reasons mentioned in the previous sentence I kept the lights on in the church. Since I slept on one of the wooden benches, my sleep that night was quite fitful, made worse by the bats that repeatedly dive-bombed their way down to me as if in protest of my taking over their sanctuary.